Superpower! Improve your Performance, Focus, and Profitability. Ford Saeks is a marketing genius. His book SUPERPOWER! is a 21st century classic, helping you to move from the theoretical to executing the application that helps you increase your profitability. Ford Saeks is the one expert to listen to when you want to go from Zero to 100 in the least amount of time with the least amount of effort. This book shows how to leap your financial position in life to the next level!Ford provides one “ah-ha” after another. I often ask myself, “Wow – why didn’t I think of that before? This is going to produce great results and, additionally is so much easier to do than the way I’ve done it all along!” Save yourself the efforts of trying to “try harder” to produce the results you want. This book shows you the ways to make better choices – and that leads to financial success both in your personal and work lives! Ford has overcome tough odds to achieve great success by working smart and working hard. This book shows you how he did and how you can do it, too. He’ll help youachieve superpower, not through magic or gimmicks, but by using his proven strategies and tactics. Read it if you want super results. If you are looking for a road map to take your potential for success and turn it into a reality then Ford’s book is a must read! Superpower is written in such a way that one feels that they are sitting right across the table with a genuine friend, as the author, generously imparts his proven methods and strategies of success, in a sincere, authentic, caring and engaging manner. The stories that Ford Saeks relates from his vast Entrepreneurial experiences are tremendously captivating, entertaining and packed with powerful lessons that enlighten and inspire! Throughout the book Ford provides empowering questionnaires that immediately jolt the mind into a state of creativity, providing inspiration, clarification and direction! SUPERPOWER is A `No-Holds Barred’ Complete Guide to Success that delivers extraordinary value and, when applied will yield very high returns for it readers! Ford Saeks has hit the ball out of the park with this book! I Give it the highest praises and thus , cannot help but recommend it to all my friends and associates – a must read that will transform your way to becoming even more creative, productive and effective – thus empowering you to achieve your goals! This book is just like Ford – it gets straight to the point and stays on point. And the point is to provide a variety of real-life ways to get MORE done – with LESS. Less effort, less frustration, less stress. Better yet, Ford includes a variety of success stories to illustrate his ideas and balances his content so it’s both insightful AND inspiring. A wonderful addition to any office library and a recommended read for everyone who would like to improve their productivity and job performance. Ford Saeks has achieved great success by working smart and working hard, and heshows you how to get things done, faster and easier. CEO United Sports Solutions, Inc. This book is what everyone needs today if they are going to succeed. The new economic realities dictate that we must change the mindsets from which we operate. If you want to be at the top of your game and enjoy life the way you want it to be, you need to read SUPERPOWER! You can bet your competition is reading it too. If you want to improve the quality of your life and those you care about…then read and implement the strategies that Ford reveals in Superpower! Time & time again, I find myself turning to Ford Saeks for advice & counsel. I have come to rely upon his ‘straightforward’ communication style, common sense and critical thinking to drive me toward better results for marketing our business. Exceptional, timely, and spot on… Ford Saeks always delivers and SUPERPOWER! is no exception. If you want to grow your business, achieve your personal goals, or increase your impact, you need to read this book! The advice is as practical as it is powerful and the book is jam-packed with ideas you can put to work to immediately produce solid results. Finally, a common sense ‘blueprint’ for success. Ford is a master of getting from A to B in a streamline process to achieve increased results. Superpower is a great resource for you and your team. President of The Emmerich Group, Inc.
After 30 years in the speaking, training, and self-improvement arena, take it from me…whatever Ford Saeks writes or says is gold! Start reading this book and do not put it down until you have learned how to think, act, and perform to achieve the results you want. Wouldn’t it be great if you had a guide to help you be your most incredible self? You have it right here. With his straight talk and common sense approach, Ford Saeks makes the process easy, intuitive and most of all, effective. This book will help get you where you want to be. CEO Victoria Labalme Communications, LLC. Ford Saeks is a brilliant thought leader in the world of personal and professional success. Follow the steps in this book and you will prosper in all areas of your life. Ford Saeks is an international expert on all matters marketing and branding. In this book he shares solid ideas and practical strategies to build your business and enhance your life. This amazing book is loaded with practical, proven strategies that you can use immediately to get what you want in every area of your life. CEO, Brian Tracy International Inc.
Ford Saeks is a master. Period. This straight-talk, no-nonsense guide will shift your thought process and laser focus your results. The guy’s a genius. Superpower! is filled with straight talk and endless ideas to help improve your results in both business and everyday life. Superpower! 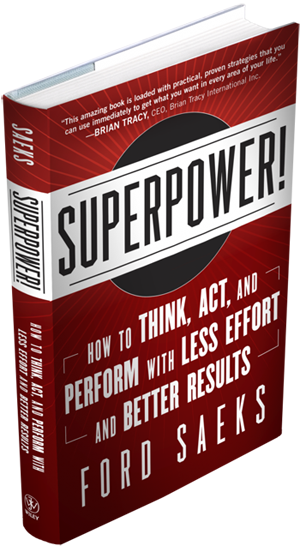 is a must-read for anyone who would like to get better results with far less effort..
Unleash your potential and your organization’s potential by implementing the simple strategies in Superpower! that can be applied to all levels of your organization—from the top down and the bottom up! Ford Saeks has the experience, insights, and unique perspective to show you how to become a Superpower. This book is a must read today, as tomorrow your competitors will have it!